Trust and confidence are topical issues. Pundits claim that citizens trust governments and public services increasingly less - identifying a powerful new erosion of confidence that, in the US, goes back at least to Watergate in the 1970s. Recently, media exposure in the UK about MP expenses has been extensive, and a court case ruled in favor of publishing expense claims and against exempting MPs from the scrutiny which all citizens are subject to under ‘freedom of information.’ As a result, revelations about everything from property speculation to bespoke duck pond houses have fueled public outcry, and survey evidence shows that citizens increasingly distrust the government with public resources. This book gathers together arguments and evidence to answers questions such as: What is trust? Can trust be boosted through regulation? What role does leadership play in rebuilding trust? How does trust and confidence affect public services? The chapters in this collection explore these questions across several countries and different sectors of public service provision: health, education, social services, the police, and the third sector. 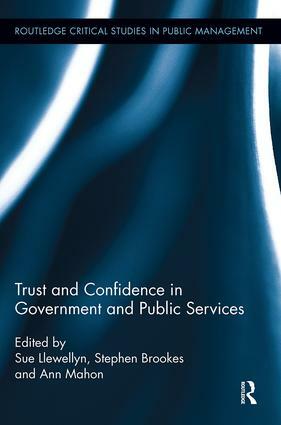 The contributions offer empirical evidence about how the issues of trust and confidence differ across countries and sectors, and develop ideas about how trust and confidence in government and public services may adjust in the information age. Sue Llewellyn is Professor of Accountability and Management Control and Director of the Herbert Simon Institute at Manchester Business School, University of Manchester, UK. Stephen Brookes is a Senior Fellow in Public Policy and Management and Head of the Innovation in Government subject group at Manchester Business School, University of Manchester, UK. He is editor (with K. Grint) of The New Public Leadership Challenge (2010). Ann Mahon is a Senior Fellow in Healthcare and Public Sector Management at Manchester Business School, University of Manchester, UK. She is editor (with K. Walshe and N. Chambers) of A Reader in Health Policy and Management (2009). In reality these trends have not so much replaced each other as elided or co-existed together – the public policy process has not gone away as a legitimate topic of study, intra-organizational management continues to be essential to the efficient provision of public services, whist the governance of inter-organizational and inter-sectoral relationships is now essential to the effective provision of these services. This series is dedicated to presenting and critiquing this important body of theory and empirical study. It will publish books that both explore and evaluate the emergent and developing nature of public administration, management and governance (in theory and practice) and examine the relationship with and contribution to the over-arching disciplines of management and organizational sociology. Books in the series will be of interest to academics and researchers in this field, students undertaking advanced studies, and reflective policy makers and practitioners.